The 3.8 hectare site was previously occupied by the former Parkhead Forge Rolling Mills and Steelworks on the western area of the site and Carntyne Dyewood Mills on the eastern area of the site. The local area has a history of heavy industrialisation. The site was cleared in 1982. The Camlachie Burn flows across the site (initially in an open channel and subsequently within a culvert). Shallow groundwater was present within the made ground – the groundwater was locally discontinuous and perched in places – monitoring data highlighted the potential for localised flows towards the north west of the site (in the north) and towards the west (in the southern area of the site). Soils and groundwaters within the western area of the site had been shown to be impacted by hydrocarbon contamination (including free product) and were considered to represent a significant risk to the water environment beneath the site. It was estimated that the affected soils covered an approximate area of 2,850m². The affected soils were recorded to be encountered at depths of between 0.6m and 1.7m bgl, extending to between 1.1m and 2.2m bgl and exhibiting an overall average thickness of 0.6m. Shallow groundwater was recorded at an average depth in the region of 1.3m bgl in this area, with thin layers of free-phase product recorded on the groundwater surface at various locations. The identified contaminants of concern were predominantly Total Petroleum Hydrocarbons (TPH) and BTEX. The groundwater within the centre of the identified contamination area was shown to be significantly impacted by very elevated concentrations of TPHs – with a maximum total TPH concentration of 5,500mg/l. Having assessed the potential options it was concluded that the on-site treatment of the impacted material for retention and re-use onsite was the most practical, cost-effective and environmentally sustainable solution. The proposed remediation works comprised of excavation, ex-situ stabilisation and re-emplacement. The excavation of soils within the identified contamination area (and validation of excavations) was undertaken by RJ McLeod in conjunction with Halcrow. Contaminated soils were stockpiled pending treatment by Envirotreat. 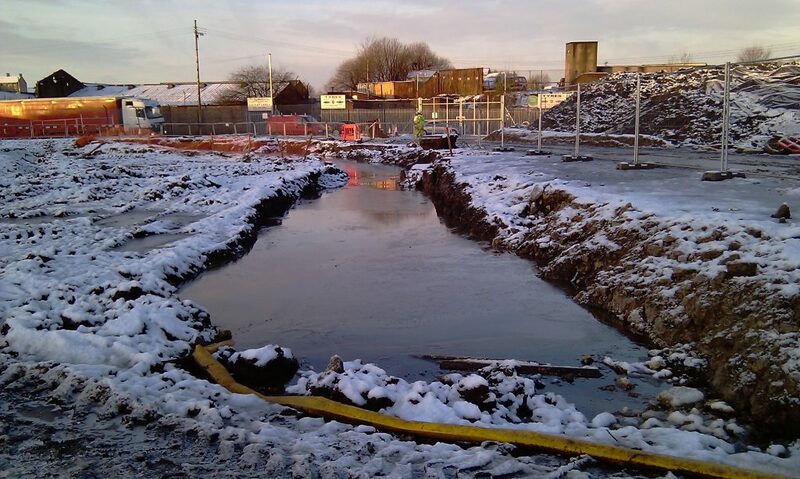 The contaminated soils were treated ex-situ utilising the designated E-Clay Stabilisation formulation. The soils were treated with the designated E-Clay. The soils were mixed with the treatment materials to produce a homogeneous mass.